The tourists were bruised and battered throughout the first three Tests, and looked to be heading the same way after Boxing Day. With the exception of the first session of the match, they kept Australia’s scoring rate in check and bowled reasonably well on a pitch which was doing little. They only took three wickets on Day 1, but then wrapped up the tail, taking the final seven wickets for just 67 runs. Alastair Cook has then led the charge for England. Chasing 327, they reached stumps on Day 2 at 9 for 491, giving them a lead of 164. With the exception of Cook, only Joe Root and Stuart Broad made it past 50, but the going hasn’t been that tough with the tourists clicking along at 3.4 runs per over. 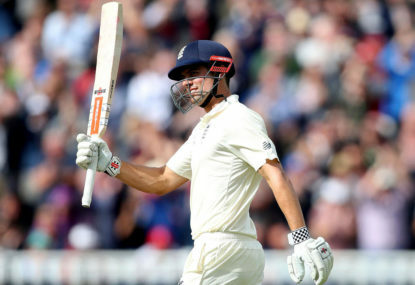 The former England captain sits on 244 not out at stumps, having batted for well over a day, setting out to prove his doubters wrong. The pitch has played a little slow at times, but it’s not that difficult for batting and while England are on top, they will be keen to keep the game moving on Day 4. Given the way Australia’s middle and lower order capitulated in the first innings, there will be a genuine level of concern in the hosts’ camp about what they will be able to achieve when they eventually get into their second innings. Unfortunately, the weather forecast for Day 4 suggests there is a good chance of us losing some time through rain. Despite the fact we have only seen 19 wickets in three days, this isn’t the easiest of pitches to bat on. Warner and Cook have made it look easy, and so England are certainly in the driver’s seat right now with their big lead, even having to bat last and potentially chase a total. They will be trying to get it as close to batting once as possible. Of course, nine down, that’ll prove difficult, but if they can add another 20 or 30 runs this morning, it could make all the difference. Whichever way you look at it, the Aussie batsmen are going to be under extreme pressure. This will be a superb test of their skills ahead of the upcoming South African series, but expect them to be on level terms or slightly ahead with some wickets in the shed come stumps today. Be sure to join The Roar for live coverage of the Ashes from 10:30am (AEDT) and don’t forget to add a comment in the section below.